to see them closer to the 19th! Not all Flat, but no Freeway riding or Tanks to avoid! will roll at 7:30am from Turtle Rock Park. An 84 mile Long Plus (4 miles for each of our 21 years) will leave at 8am. 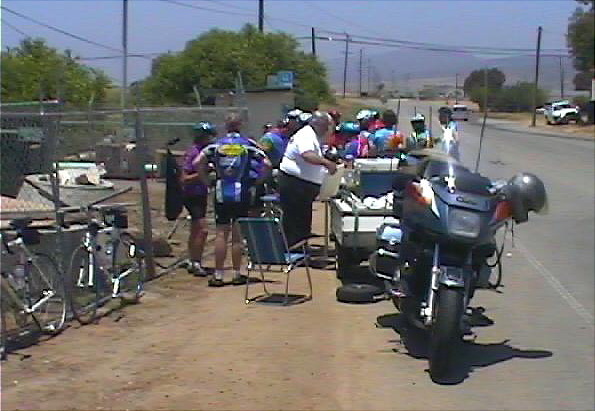 A 63 mile / 101 KM Metric Century (3 miles for each year) will leave at 8:30. We will pass plenty of coffee shacks along the routes, and you will have a chance to stop for your own brunch. to enjoy out there on the Santa Ana River in Yorba Regional Park between the River Trail and La Palma. The Centurians will hit it twice: at 48 and 64 miles. The Long Plus will get there at 48 miles. The Metric Centurians will get there at 31 miles. These are the 3 more typical Saturday rides... except for starting in TRCP! The set of 42, 21 & short 21 KM ~ 13 mile loops will leave at 9am. Final routes will be printed out on June 18th for the ride start; may change some still! These are the club's Saturday Morning rides for June 19th, so don't go to Deerfield! Please register before the 2nd Monday in June (June 14) so we have enough food!